Thirteen students left a special Earth Day celebration Saturday at Amarillo Botanical Gardens with $1,000 Earth Steward Scholarships. 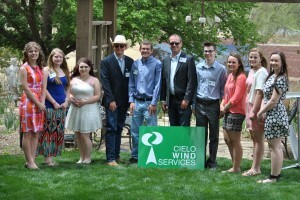 This is the eighth year Cielo Wind Power has chosen students for the honor. Eligible students live in areas were Cielo operates and must apply and write an essay describing how they could be, are or how to be a good steward of the Earth. Adrian High School student James Treiber, 18, received a scholarship. Treiber said he wrote about how to create a greener future. “We can start by changing the education system,” said Treiber, who thinks children should be taught from a young age how to be “green.” Treiber plans on pursuing a nursing degree at Amarillo College and said the money would help him start. “All the choices are about being a good steward of the Earth,” Debbie Cottrell, field accountant for the Amarillo office, said of the essay choices students could choose from. Cottrell said seeing the qualifications, academics and words of the students chosen, gives her hope for the future generation. “It makes me a little more comfortable knowing we’re in good hands,” Cottrell said. The first 200 guests received free admission, and refreshments were provided. Guests were also treated to live music and face painting for the kids. “I love the music feel,” Cottrell said. “The atmosphere is family-friendly and perfect for a live band, just some of the reasons it’s held at the Botanical Gardens.” The event concluded with a monarch butterfly release, which every attendee was welcome to join in. Cielo Wind Power owns wind farms in several areas with a corporate office in Austin. The Amarillo office has a staff of 20 employees.